In August 2005, I discovered that Ainori was not only popular in Japan, but also all over the world thanks to Bit Torrent technology. So I decided to write a summary of each episode, and do a translation of the weekly photo captions from the official site. What do I get out of this? I get to improve my Japanese, I get more traffic to my blog, but above all, I get the satisfaction of knowing many non-Japanese speakers all over the world can appreciate a truly unique reality show. Enjoy, and don’t hesitate to post any comments or questions you may have. 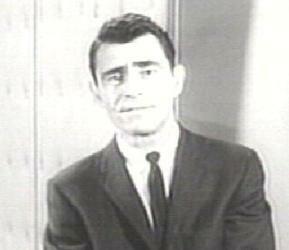 This week was weird… Like twilight zone weird! Where do I start? Arashi mistaking chicken for pork (well, not so surprising for him)! Mie with no make up AND wearing glasses! TK rudely cutting in while Mie and Suuzan were talking! The group meeting the tallest man in the world! The boys wearing tights! The whole group performing ballet in front of a large audience! Oh, and my personal favorite, Hide finally waking up and smelling the coffee! Weeeiiiirrrrd! These have got to be the two products with the worst names in Japan, ever! 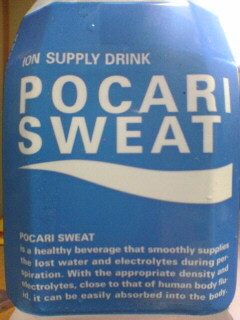 “Pocari Sweat“. They call it like that because it’s supposed to help recover watery fluids after you sweat a lot. It took me two years before I had the guts to try it out. It’s not bad actually. “Creap“: Short for “Creamy Powder”. Use it when you serve coffee to people you really don’t like. Well, that’s it! The dealine to mail my final assignment to complete my M.A. in Applied Linguistics is in one week from now. Three years of madness! It’s an elective class, mind you, so there’s not too much pressure. Still, I’ll be really, really glad when it’s over. Working more than 60 hours a week and trying to study at the same time is insane! 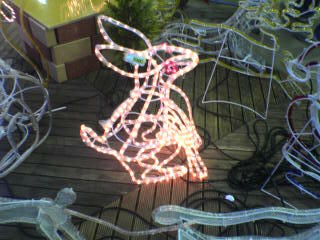 A Christmas rabbit!? Confusion with Easter, maybe? 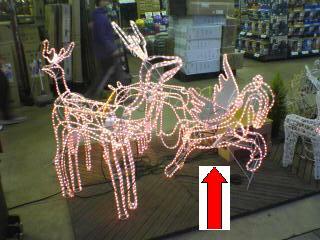 A Christmas Pegasus!? I give up! You are currently browsing the ☆MY BLOG☆僕のブログ☆MON BLOG☆ blog archives for October, 2005.